The dissertation describes the processes surrounding the production of investigative knowledge within the Danish Police based on in-depth analyses of how investigators seek out, discover, and produce knowledge that can assist in the production of evidence for identification and prosecution. The central question informing the dissertation is the question of how knowledge comes about, and how such processes of knowledge can be studied anthropologically. The dissertation develops a theoretical frame for the study of knowledge, which addresses the becoming of knowledge as the effect of the interaction of heterogeneous 'parts' producing knowledge as a complex 'whole'. 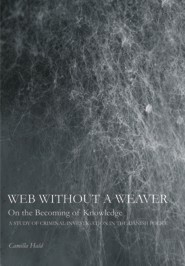 This is done by investigating how tacit and embodied forms of knowledge (experience or 'craft knowledge') as well as more abstract forms and 'fields' (e.g., natural, medical or forensic sciences, or legal and technical procedures) contribute to and impact the creation of knowledge of a particular crime. The central point of argumentation of the dissertation is that the becoming of knowledge cannot be ascribed to one 'part'. Knowledge creation must be analysed and theorised as a result of the complex interaction between investigator, environment, objects, technology, theory, procedure, etc. and the 'structures of possibility' individual 'parts' contribute to the workings of the 'whole'. It is this interaction and the space which arises from it that this dissertation seeks to investigate, analyse, and theorise. Camilla Hald received a M.Sc. in Anthropology from the University of Copenhagen in 2002 and a Ph.D. in Anthropology and Ethnography from the University of Aarhus in 2011. She is employed as chief advisor and head of research, innovation, and partnerships at the Danish Police Knowledge and Research Centre, where she has been employed since 2007. During her studies, she has acted as a consultant for the Danish National Police and taught criminology at the Danish Police College. Camilla Hald is working on epistemological and methodological issues related to crime investigation and is actively involved in the development of police science as a distinct discipline. She is a member of the Research and Science Working Group, an expert group appointed by the European Police College (CEPOL) tasked with promoting the use and development of research and science in police practice within the European Union.